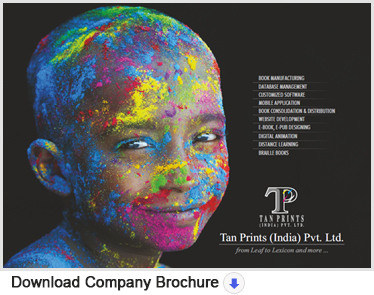 At Tan Prints we have been carrying out specialized printing jobs since 1980 in our beautifully landscaped facility spread over 10,000 sq. mtrs. We have sophisticated facilities under one roof for Bulk Printing, Binding & Data Management, Data Entry, Proof-reading, Software & Website designing, Animation, Books, e-Books making & distribution. Latest feather in our cap is Distance Learning Program. Custom made content development is our speciality. Tan Prints developed the capability to produce Braille books as well. We can help schools and institutions in getting lab equipment. Tan Prints has strong presence in countries like Nigeria, Ghana, Ethiopia, Rwanda, Uganda, Kenya, Tanzania and Cameroon to name a few countries. We have been catering to reputed Book Publishers/Distributors along with Government universities and institutes. Quality Management and cost effective handling of resources enables us to provide service to our customers on optimal competitive terms. Success of our mission lies in the rare expertise and dedication of our staff of about 300 professionally-oriented highly motivated individuals.